The Sahara Forest Project is meant to mimic a natural ecosystem. Its designers say the concept should work in any low-altitude desert area near a large source of salt water. A small prototype has been operating in Qatar since 2012 and a second pilot site is planned for Jordan. Above, an artist’s rendering shows what a full-scale facility might look like. Graphic provided by Sahara Forest Project. What if we could transform sand, salt water, sunlight, and carbon dioxide into soil, fresh water, vegetables, trees, biofuel, and electricity? That’s what an ambitious Norwegian-led initiative has been doing in the desert near Doha for the last two years. The Sahara Forest Project combines several technologies – including concentrated solar power, evaporative cooling, and thermal desalination – to function the way an ecosystem functions, where the waste product from one component provides fuel or food for another. 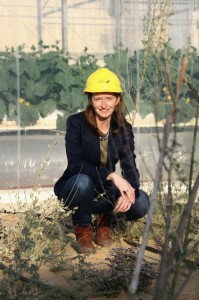 Astrophysicist Virginia Corless is the project’s Science and Development Manager. So CO2 from a neighboring ammonia factory is pumped into a state-of-the-art greenhouse, making the cucumber plants grow faster. Seawater from the nearby Persian Gulf cools the air inside the greenhouse before it’s transformed into drinking water. Outside, shrubs and grasses sprout in the shade of cardboard evaporators. It’s an exciting idea, to be sure. But how useful is this kind of complex, capital-intensive, high-tech approach for the two billion people who live in the world’s arid areas? Jonathan Miller‘s story has been viewed more than 425,000 times on YouTube since it originally aired on PBS NewsHour in 2013. Now it’s being rebroadcast as part of Reveal TV, a project of the Center for Investigative Reporting and Oregon Public Broadcasting. You can catch the segment live on Tuesday, February 10 at 11 pm on KQED TV in San Francisco. Or watch it anytime right here. And if you’re thirsty for more, check out a radio version here.